Our Nest in the City: Inspired to Taste Canada is coming to Montreal! Inspired to Taste Canada is coming to Montreal! I wanted to let you guys know about a really fun culinary event happening this week in Montreal! Hudson Bay on Saint-Catherine is hosting a special cook book launch by two Quebecois authors, Hubert Comier and Martin Juneau on May 25th from 12pm-3pm. Juneau wrote Simplicité Culinaire: 30 Ingrédients Déclinés en 100 Recettes and Comier wrote Les Légumineuses et Cie. I can't wait to meet these chefs, taste some of their creations, and read their incredible cook books! If you'd like to come to the FREE event, just RSVP here. 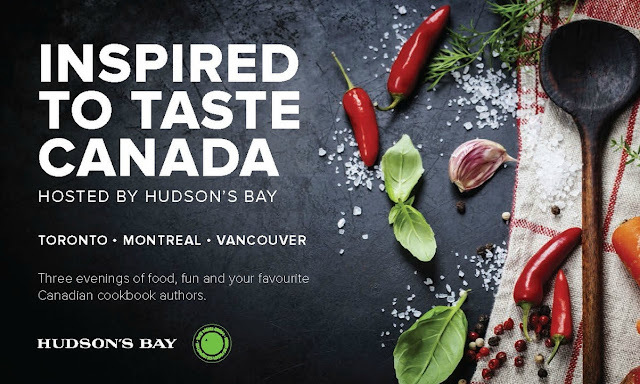 There's also a Taste Canada event in Vancouver coming up in June, and you can RSVP for that one if you're a west coaster, here. I'll be there and would love to see you!